Historic timber buildings — tell me your story! Originially published on TimberHomeNation.com on March 16, 2010. Last night, I went to an Altan concert at Wolf Trap National Park for the Performing Arts in nearby Vienna, Virginia. The concert was phenomenal — Altan is the world’s preeminent traditional Irish music group, and between Mairéad Ní Mhaonaigh’s pure soprano and the entire band’s incredible talents on the fiddle, guitar, accordion and bouzouki, it was one of those rare experiences where the music seems to become much more than the sum of each of the players’ individual contributions. I was expecting a great show, and I got that in spades, but I was pleasantly surprised with the venue where the concert was held. 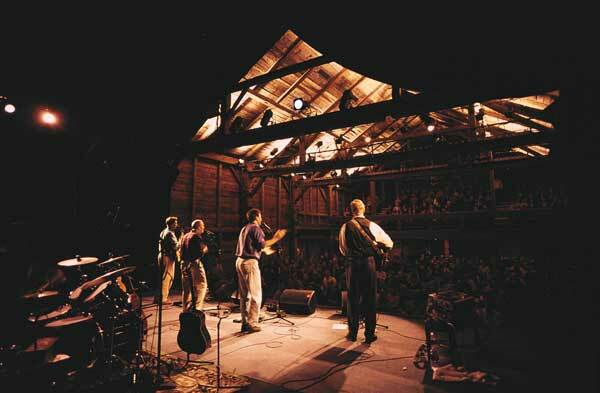 Wolf Trap has a great outdoor amphitheater for summer shows, but for year-round events, it has The Barns. Turns out Catherine Filene Shouse, Wolf Trap’s founding patron, had attended a concert in a barn in Maine and was very impressed by the acoustic qualities offered by the time-worn timbers. So in 1981, she commissioned someone to locate (and relocate) some similar barns to be used for informal events at Wolf Trap. Master craftsman and barn historian Richard W. Babcock of Hancock, Massachusetts, found two 18th-century structures in upstate New York, carefully moved them to their present location and reassembled them using the same methods the original craftsmen did back in the 1700s. The two barns are adjoining, with the larger of the two serving as the concert hall while the smaller one houses a reception area with a concession stand and the box office. Seats inside the larger barn are either in the hayloft or on the threshing floor, and surrounded by the weathered beams, you feel completely like you’re stepping a little out of reality. The builders reversed the walls so the weather-hewn sides would be exposed to the patrons inside, and although they’re rough and worn, it’s clear the structure is strong. Maybe it was the barn or maybe it was the band, but I agree that the acoustics in there were fantastic, to say the least. At times, the music took on a warm hum not produced by any of the musicians’ instruments individually — I’ve never heard anything quite like it before. Normally, we write about construction details, design ideas, building tips and tricks and advice on how to pick the best land, and in doing so, we’re sharing the industry’s latest and greatest information on how to create a modern timber-frame home. But it’s clear that a lot can be learned from older structures as well. The construction crews at Wolf Trap used ropes, gin poles, true mechanical block-and-tackle methods and brute manpower to rebuild these barns at their new home, and flimsy construction would never have allowed them to be torn down, transported hundreds of miles and successfully reassembled in a totally different location (not to mention the centuries of wear they experienced before the move). The original owners and builders didn’t have access to kiln-dried beams, manufactured varnishes and energy-efficient windows, and yet this structure has stood the test of time. Sitting inside and listening to some of the world’s most talented musicians, I couldn’t help but want to know more about the building’s history. The whole thing got me thinking about similar structures across the country. I always get a little nostalgic when I see those ramshackle old houses and barns on the side of some country road, darkened by age and choked by weeds, but I’d be curious to learn about restored timber buildings that have been salvaged and given new lives. Maybe you know of something, a diner built in an old prospector’s cabin or a country church in what was once an old mill. If you do, please share them with me, and I’d love to learn more about these timeless structures and turn that around with an article for the magazine. Timber homes have a rich history, and the more we know about where they came from, how they were created and the ways in which they’ve served, the more we’ll know of the centuries of knowledge acquired by the builders of the past.